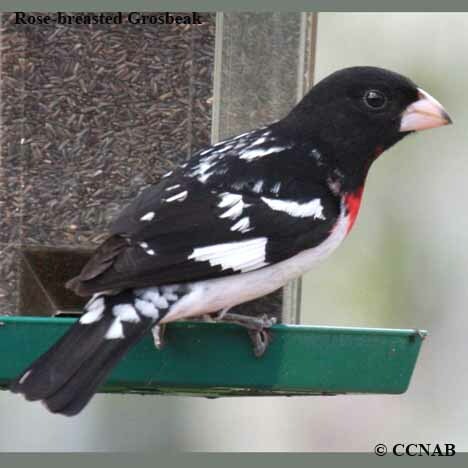 Species: The Rose-breasted Grosbeak (Pheucticus ludovicianus), is an attractive large billed forest dwelling bird, found throughout most of Canada, and into the eastern regions of the USA. 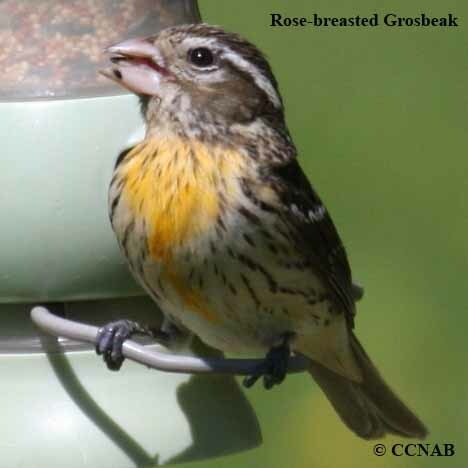 Usually, seen at bird feeders in the springtime, where it is attracted to black-oiled sunflower seeds. Its diet consist of seeds, insects and fruit. Distinctions: Sexually dimorphic, whereas the male in breeding plumage is seen with a black head, back, tail and wings, with white wing bars. It received its name by its rose-coloured bib type ban on a white breast. The female is mainly brown overall in appearance, with brown streaking on a dull white breast. 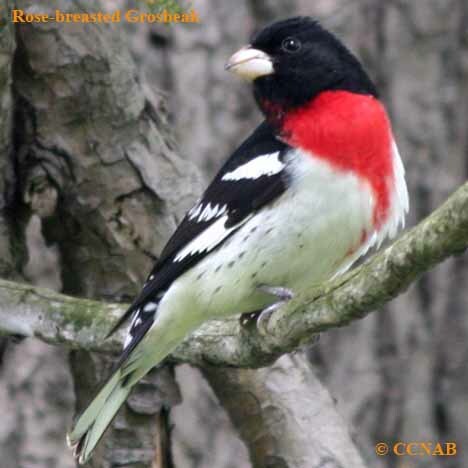 Juveniles are similar to the females, as are the males, when seen in non-breeding plumage during the winter months. Voice: Loud flute like warbling lyrics, usually song from high up in the crown of the tree tops. Nesting: Four to five purplish, white spotted eggs. Builds its nest in a deciduous forest and forest edges. 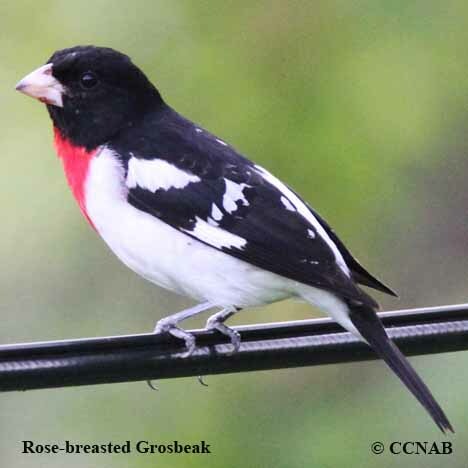 The Rose-breasted Grosbeak will have one to two broods at year. 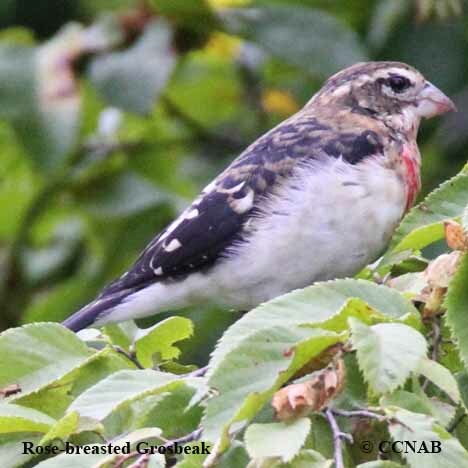 Distribution: Seen in the breeding season, from Nova Scotia to the borders of British Columbia and the North West Territories, into the central regions of the USA to the Atlantic coast. 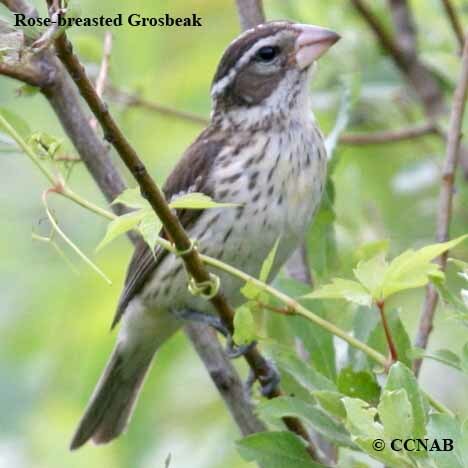 Migrates into Mexico and Central America in late fall and returns back in late April and early May the following year.